Nestled in the valleys of Virginia rests the Ashburn community — where Cooper’s Hawk Winery & Restaurant at Belmont Chase offers an upscale casual dining experience with a full-service bar, private barrel-aging room, Napa-style tasting room and retail gift store. Paying tribute to the town it loves, Cooper’s Hawk at Belmont Chase recently released a city-etched, limited edition bottle of a special blend wine. The sand-carved bottle depicts the Ashburn city skyline including Regency Centers’ Belmont Chase shopping center and is available for purchase onsite. The lines etched on the coal black bottle show off Ashburn’s sense of community. Inside the keepsake bottle is a blend of flavors — think blackberry, strawberry, and cherry alongside notes of plum, vanilla, butterscotch, and nutmeg. Then the full-bodied texture of Cooper’s Hawk Ashburn and dark fruit and spices extend on the lengthy finish. 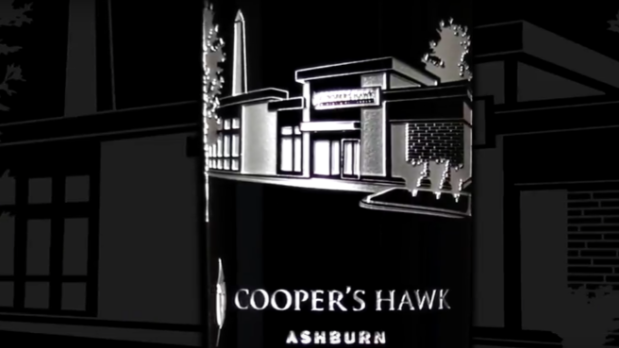 The wine is one of the many keepsake bottles honoring Cooper’s Hawk locations throughout the U.S. See the magic here.